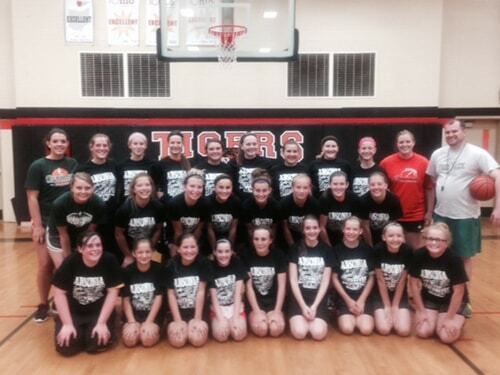 Coaches and players from Wilmington College led a camp with the Ansonia girls basketball team as part of the Tigers’ summer workouts. ANSONIA – The Ansonia girls basketball team’s summer workouts included a visit from the coaching staff and players of the Wilmington College women’s basketball team. Ansonia had 30 junior high and high school athletes participate in the three-day camp this past month where they worked on a bit of everything including offense, defense and fundamentals. Ansonia will return every starter from this past year’s team plus its top players off the bench as the Lady Tigers had a young squad this past season. The Tigers also have a strong freshman class coming up, Bolin said, and are getting players back from injuries that hit the team hard at the end of this past season. During the summer Ansonia has participated in a league in Richmond, Ind., and also played in shootouts at National Trail and New Castle, Indiana. The team posted winning records in each of its summer shootouts and leagues. “We’re all ready for a vacation and a break,” Bolin said of his team’s busy summer. Junior varsity coach Sara Mayo was instrumental to the summer program, Bolin said, including directing the summer camp. The Tigers now are hoping they’ll be able to build off their recent success when they get back to work during the fall.